During summer 2011, CEO Terry Gou shared his vision of installing one million robots to help automate the most dangerous and menial tasks at Foxconn's facilities. Foxconn, by the way, manufactures many of the computers, tablets and phones sold by leading U.S. companies like Apple, HP and Dell. The Wall Street Journal though brings us news that Foxconn's pending transition from warm bodied workers to coldly precise machines hasn't exactly been a smooth one. Critics of the plan say the investment is too big -- somewhere between $2.1 and $10 billion -- depending on just how machine-driven Gou wants Foxconn to become. Others note that Foxconn's clientele are primarily big tech companies with frequently updated, short-lived products. Rapidly changing product line-ups aren't conducive to paying off huge assembly line investments. 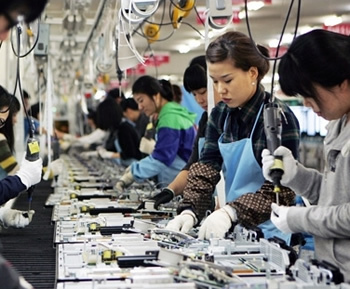 Foxconn workers themselves report feeling the ripples produced by the installation of automated systems. Some workers recount being shuffled to different assembly lines as robots dutifully perform their tasks at their former location while others have been placed in charge of the machines. It was discovered several days ago that some of Apple's newest 21.5-inch iMacs were "Assembled in USA" -- an unusual claim for any tech company to make since such work is almost exclusively performed in Asian factories. A few days later though, Apple CEO Tim Cook confirmed that some Macs will be manufacturered in the U.S. in 2013, claiming Apple has spent a long time and invested $100 million to make it happen. Incidentally, Lenovo is another big computer maker who's bringing jobs back to the U.S. The company just opened a production line in North Carolina.